Speaking in the House of Assembly today [June 15], Minister of Economic Development and Tourism Jamahl Simmons said, “Bermudians are again getting ready for the music, parades, parties, and pageantry of Bermuda Heroes Weekend Carnival; a cultural and colourful spectacle that has become, in just a few short years, one of our island’s most significant events. “As all of the Carnival events are very social media friendly, when the colour, energy, and motion of Carnival is added to the natural beauty of Bermuda and the warmth and beauty of our People; interest in Bermuda’s tourism, cultural, and natural assets can only grow stronger and stronger. “Bermuda Carnival has been deemed a Signature Event by the BTA and its growing significance to Bermuda’s Tourism Product is actively encouraged by the Government. “Therefore, I am proud to announce that the Government has partnered with BHW Ltd. in order to deliver another Bermuda Heroes Weekend Carnival in 2018. Accordingly the Government is today announcing sponsorship of The 2018 Heroes Weekend Carnival for $125,000. “Under the Agreement, the Government will provide the human and financial resources to ensure a solid foundation that underpins the Event’s operations, assists in addressing old debts, all while the leadership of BHW Ltd. continues to execute their unprecedented and hugely successful promotional, logistic, and organizational operation. “The Ministry has analyzed both the Return on Investment, and the Economic Impact associated with sponsoring the 2018 Carnival, and we anticipate that on both criteria, the investment will produce tangible and intangible benefits far greater than the amount invested. Update: BHW Limited also received $100,000 sponsorship from the BTA, with the multi year contract with the BTA listed from 1-Jan-17 – 31-Aug-18. Mr. Speaker, Bermudians are again getting ready for the music, parades, parties, and pageantry of Bermuda Heroes Weekend Carnival; a cultural and colourful spectacle that has become, in just a few short years, one of our island’s most significant events. Mr. Speaker, as all of the Carnival events are very Social Media Friendly, when the colour, energy, and motion of Carnival is added to the natural beauty of Bermuda and the warmth and beauty of our People; interest in Bermuda’s tourism, cultural, and natural assets can only grow stronger and stronger. Bermuda Carnival has been deemed a Signature Event by the BTA and its growing significance to Bermuda’s Tourism Product is actively encouraged by the Government. Therefore, I am proud to announce that the Government has partnered with BHW Ltd. in order to deliver another Bermuda Heroes Weekend Carnival in 2018. Accordingly the Government is today announcing sponsorship of The 2018 Heroes Weekend Carnival for $125,000. Mr. Speaker, this dynamic new partnership will ensure that Heroes’ Weekend Carnival is sustained long into the future and will be cemented onto Bermuda’s Social and Cultural calendar. Under the Agreement, the Government will provide the human and financial resources to ensure a solid foundation that underpins the Event’s operations, assists in addressing old debts, all while the leadership of BHW Ltd. continues to execute their unprecedented and hugely successful promotional, logistic, and organizational operation. The Ministry has analyzed both the Return on Investment, and the Economic Impact associated with sponsoring the 2018 Carnival, and we anticipate that on both criteria, the investment will produce tangible and intangible benefits far greater than the amount invested. For example Mr. Speaker, from the 2017 BTA Year-in-Review it stated that the Bermuda Heroes Weekend [BHW] – which was held from 16-19 June 2017 – was a resounding success based on visitor feedback. The final visitor numbers reached 686, while monitoring throughout the weekend showed more participants at each of the scheduled events, more spectators lining the streets of the parade – and more revelers out for the raft-up celebration than ever before. The images and footage shared on social media, websites and blogs by visiting artists, journalists and guests provided Bermuda with heightened exposure on various channels targeting a younger demographic. 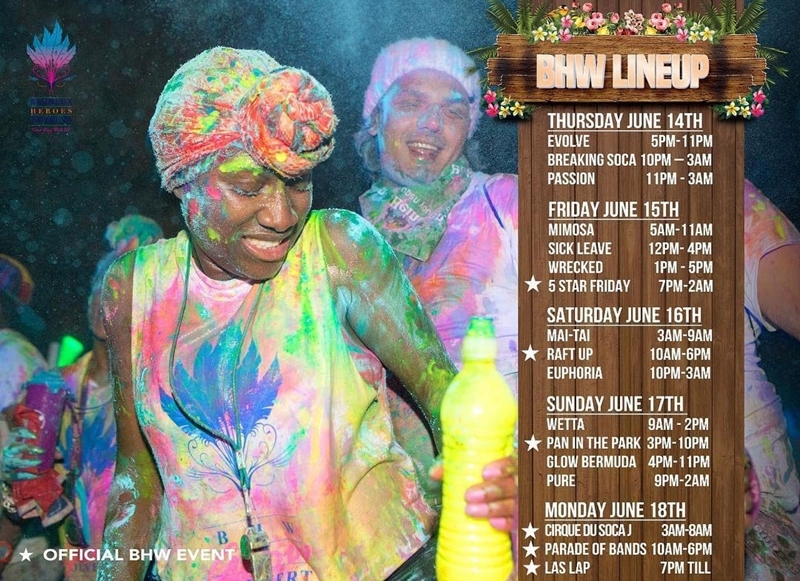 Feedback on this year’s event indicates BHW’s continual product enhancement has made Bermuda a must-go destination among carnival enthusiasts and adventure seekers. Mr. Speaker, we continue to break the image of Bermuda as a destination only for the “newlywed or nearly dead.” Our visitor numbers show we are attracting younger, more diverse visitors to our shores – and the buzz about Bermuda continues to grow. Yet Mr. Speaker we are not content with just the growth and expansion of Bermuda Heroes Weekend Carnival as a local cultural highlight and as an event with international appeal. We must not forget the true meaning of Heroes Weekend; recognizing those Bermudians who through their work, sacrifice and leadership helped move the dial on freedom, justice and equality in Bermuda. Going forward the honoring of our Heroes will be restored to prominence. Furthermore, Bermuda Heroes Weekend will once again be more closely linked to our historical traditions such as the Annual Comet Race. In closing Mr. Speaker, we wish BHW Ltd. good luck over the next week, and we trust that everyone attending, whether local or visiting, will have a safe, fun, “Bermudaful” experience. Isn’t it interesting. Suddenly the PLP understands what an investment is, and what the benefits might be. A very exciting Government investment in a very popular and growing event. Congratulations to all involved in making this happen. Wishing everyone a safe and enjoyable Heroes Weekend in Bermuda. So you can find money for some foreign cultural event but not to fix garbage trucks or protect our children by following the law and giving them legal counsel? Money well spent. Let’s provide the already established BHW with taxpayer’s money. We have so much of it. Great work. Spend money to bring in Tourists then watch them wait for buses that will never arrive because they’re all cancelled. That will get great publicity for Bermuda. Way to go PLP. If you can’t run a bus service then forget about FinTech and all the others. Since when is Carnival Bermuda’s heritage? I guess we are part of the Islands now. SMH wth is next. This government needs to go like now. It has been part of our heritage since 2015. Three whole years. Just trying to make sense of this. $125,000 in addition to the $100,000 already being given by the BTA. In total $225,000? Are the BHW events free? The taxpayers are paying off debt for a private company? I am confused. This has nothing to do with enjoying the music or the events surrounding it. Some people need to stop complaining! Did the government have money for Americas Cuo? No but the OBA continued to borrow from the bank. Just look at the total cost to host the AC! Stop it!